"A delicious taste of homemade beans which can be served as a main course or as a side dish. Especially great for football Sundays, or frozen for a later occasion." 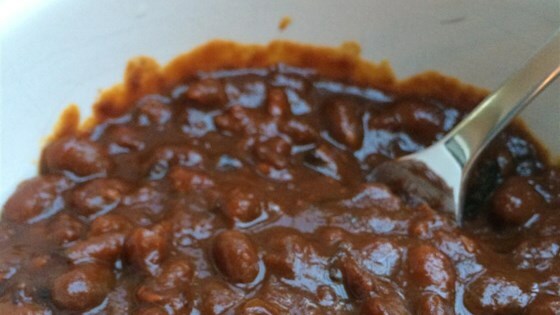 Drain soaking liquid from beans, and place them in a Slow Cooker. Stir ketchup, water, molasses, onion, mustard, salt, bacon, and brown sugar into the beans until well mixed. Cover, and cook on LOW for 8 to 10 hours, stirring occasionally if possible, though not necessary. Flavor was pretty good, a little on the sweet side. Will certainly make again, but with a bit less molasses/sugar.